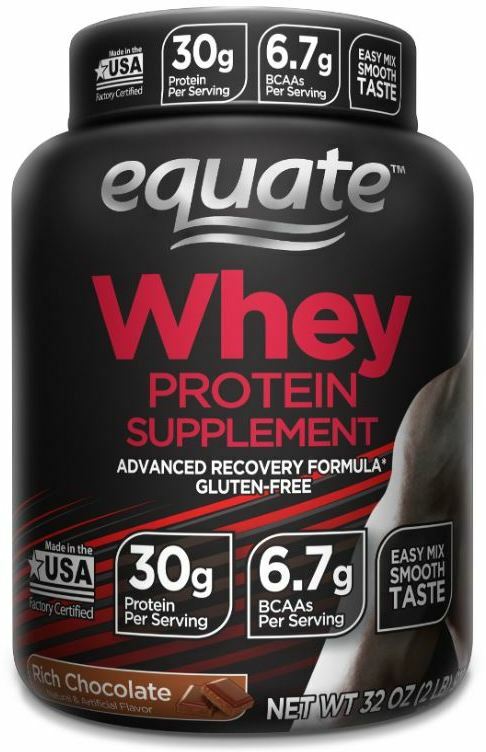 Equate Rich Chocolate Whey Protein Supplement is the perfect solution for anyone interested in maximizing the results of their workout, as well as those who want to add something healthy and delicious to their everyday diet. Each serving packs a wallop with 30 grams of protein- a great way to supplement your normal diet. This rich, chocolate protein powder mixes easily into milk, water, or your favorite juice and has a smooth, velvety taste. In addition to boosting your protein intake, this delicious drink delivers 6.7 grams of branched chain amino acids in each serving- the building blocks of good protein. Low in fat with nine grams of carbohydrates that include maltodextrin, a complex carbohydrate not readily converted to fat, this supplement delivers the ideal balance of what your body needs. This advanced recovery formula is an ideal post-workout replenishment and can also be enjoyed before exercise to quickly fuel up. Each container of Equate Rich Chocolate Whey Protein Supplement includes 18 servings, making this an easy and affordable way to get your nutrition every day.